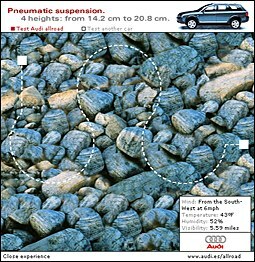 The Audi allroad is Audi's first off-road car. Of special note among its new features are its pneumatic suspension with 4 different pre-set height levels, its reduced position in the Low Range and its quattro traction, redesigned to optimise performance. The driving experience puts these features to the test. One by one. 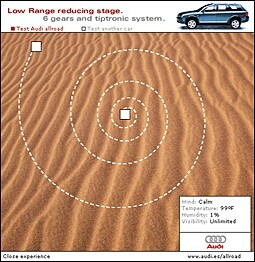 Try out different terrains with either an allroad or other model of car and, interactively, you'll find out what the main difference is: control.